Imagine wandering off in the middle of a dark cold night and staring into the rabid eyes of a gollum-like creature in the woods with one arm sprouting out of its chest. Undoubtedly, you would scream or run, but that is not the reaction that the Morgan family had. The Morgans, Meg, Rowan, James and Silly, are a stereotypical family that are forced to move to their grandparents’ mansion in England because of a fever that is spreading across America. Laura L. Sullivans` fantasy Under The Green Hill is an exciting page turner that will immediately hook you. Against their grandparents’ orders, the Morgan children take a midnight walk into the woods where they encounter a boy named Gul Ghillie, who they decide to follow to a party called the mayday party. Along the way they find creatures called brownies, who are half human and half beast. Gul brings them to a place under a hill where they find guards, brownies, and fairies who are gathering for the May Day party. The May Queen, who is queen of the fairies, tricks Rowan into fighting against a fairy at the upcoming midsummer celebration. The May Queen says to Rowan, “It is unkind to remind us of what is to come. There is time enough to gird ourselves for battle and midsummer is many days away.” Frightened, but resolved for the challenge, Rowan practices in the upcoming weeks, with Gul and Meg training him to prepare for the battle. The Morgan children had quite a unique adventure which they did not expect that summer in England. They encountered a magical world they only thought was make-believe before. This world taught them several life lessons. One is to heed the orders of their grandparents, for if they hadn’t they wouldn’t have found themselves into such trouble. However, one good thing that came of their wild adventure was learning to work together and stand by one another. 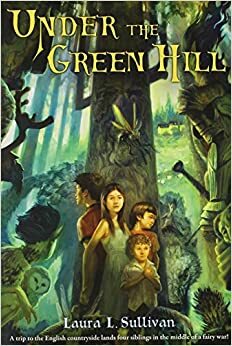 Under the Green Hill is a fun, exciting story, rich with detail from a fantastic world that I highly recommend. It made me want to keep reading after every page. It discusses character vs. character and character vs. self. For example in character vs. character, Megan argues with Rowan because he said yes when the queen offered to be in the midsummer war. The story shows character vs self when Megan is debating in her mind whether or not to tell her great-grand mother about Megan and her siblings going into the forest after her great grandmother told him not to told them not to. I recommend this book to people who like Harry Potter series and the Narnia series.